The Global Volcanism Program has no activity reports for Helgrindur. The Global Volcanism Program has no Weekly Reports available for Helgrindur. The Global Volcanism Program has no Bulletin Reports available for Helgrindur. Helgrindur (also known as Lysuhóll or Lysukard) is one of Iceland's smallest volcanic systems. It consists of a chain of small alkali olivine basaltic cinder cones and vents along a WNW-ESE line cutting across the central Snaefellsnes Peninsula in western Iceland. The slightly arcuate line of Quaternary vents extends to the northern coast of the peninsula. Helgrindur is the central of three volcanic systems occupying the peninsula. The latest eruption is undated, but the volcanic field has been active during the Holocene. Jakobsson S P, 1972. Chemistry and distribution pattern of recent basaltic rocks in Iceland. Lithos, 5: 365-386. Johannesson H, 1982. Summary of the geology of Snaefellsnes. Arbok Ferdafelags Islands 1982, p 151-172 (in Icelandic). Kjartansson G, 1968. Geological map of Iceland, sheet 2, west-central Iceland. Icelandic Museum Nat Hist, 1:250,000 geol map. The Global Volcanism Program is not aware of any Holocene eruptions from Helgrindur. If this volcano has had large eruptions (VEI >= 4) prior to 10,000 years ago, information might be found on the Helgrindur page in the LaMEVE (Large Magnitude Explosive Volcanic Eruptions) database, a part of the Volcano Global Risk Identification and Analysis Project (VOGRIPA). There is no Deformation History data available for Helgrindur. There is no Emissions History data available for Helgrindur. Lysuhöll, Iceland's smallest volcanic system, consists of a chain of small cinder cones and vents along a WNW-ESE line cutting diagonally across the Snæfellsnes Peninsula in the center of the photo. 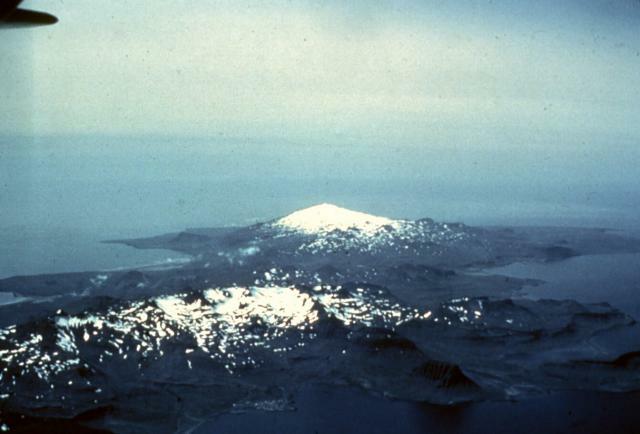 The cones and vents of the Lysuhöll volcanic system, seen here from the ENE, are located between the snow-covered Helgrindur mountains in the foreground and the glacier-covered Snæfellsjökull volcano in the background. The latest eruptions from Lysuhöll occurred during the Holocene. Photo by Thorvaldur Bragason, Iceland Geodetic Survey (courtesy of Richie Williams, U.S. Geological Survey). 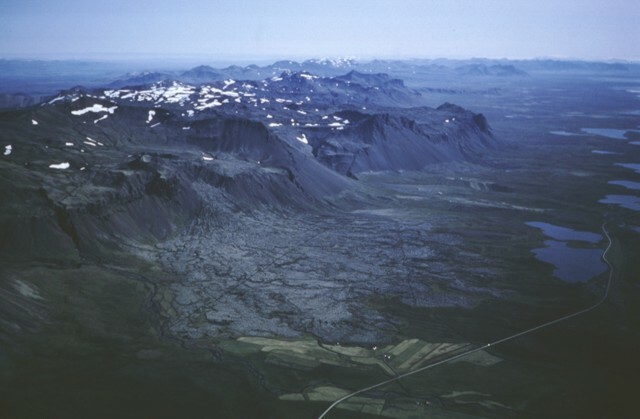 An aerial view looking east down the Snaefellsnes Peninsula shows the Bláfeldarhraun lava flow in the foreground, which originated from a pyroclastic cone in the highlands. The cone and flow are part of the Helgrindur (Lysuhóll) volcanic system, which consists of a chain of small alkali olivine basaltic cinder cones and vents along a WNW-ESE line cutting across the central Snaefellsnes Peninsula. The terminus of the Bláfeldarhraun lava flow is seen in the middle ground to the left of the farm houses. The flow originated from the pyroclastic cone on the left-center horizon and descended in the large lava cascade visible in the center of this view from the south. The flow is one of several Holocene lava flows of the Helgrindur (Lysuhóll) volcanic system on the Snaefellsnes Peninsula. The Global Volcanism Program has no maps available for Helgrindur. There are no samples for Helgrindur in the Smithsonian's NMNH Department of Mineral Sciences Rock and Ore collection. Catalogue of Icelandic Volcanoes (Link to Helgrindur) The Catalogue of Icelandic Volcanoes is an interactive, web-based tool, containing information on volcanic systems that belong to the active volcanic zones of Iceland. It is a collaboration of the Icelandic Meteorological Office (the state volcano observatory), the Institute of Earth Sciences at the University of Iceland, and the Civil Protection Department of the National Commissioner of the Iceland Police, with contributions from a large number of specialists in Iceland and elsewhere. This official publication is intended to serve as an accurate and up-to-date source of information about active volcanoes in Iceland and their characteristics. 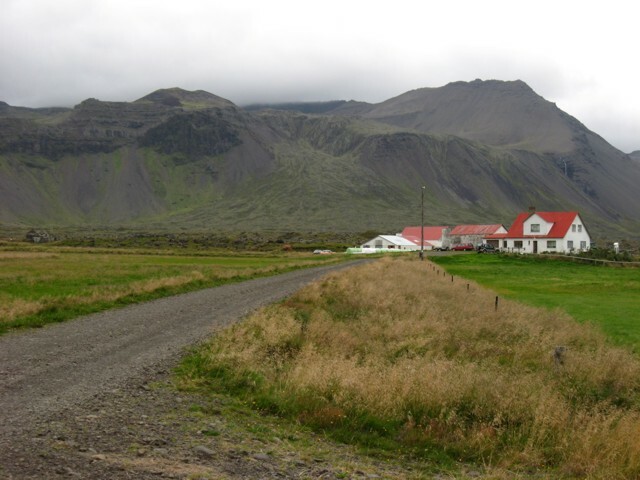 The Catalogue forms a part of an integrated volcanic risk assessment project in Iceland GOSVÁ (commenced in 2012), as well as being part of the effort of FUTUREVOLC (2012-2016) on establishing an Icelandic volcano supersite. Large Eruptions of Helgrindur Information about large Quaternary eruptions (VEI >= 4) is cataloged in the Large Magnitude Explosive Volcanic Eruptions (LaMEVE) database of the Volcano Global Risk Identification and Analysis Project (VOGRIPA).